Jabalpur is a cultural capital city of Madhya Pradesh. It is located on the bank of holy Narmada river with many popular ghats and temples. City is surrounded by many popular tourist destinations like Kanha national park, Bandhavgarh, Amarkantak, Pachmarhi, Pench national park etc. Due to presence of large number of surrounding tourist destinations and presence of well connected railway station and airport, Jabalpur is considered as the best option for arrival and departure for visiting these popular tourist attractions of Central India. We are offering all travel service for all these tourist destination which includes tour packages, hotel booking, jungle safari arrangements, taxi service etc. Here we have shared our tariff information so that interested customers can go through it and accordingly plan their budget and proceed for booking. Above rates are valid from 01/Oct/2018 - 30/June/2019 and expressed in Indian National Rupee currency. Rates subject to change with change in fuel price. Take final quote through email only in written format. Telephonic assurances, rates are not considered valid. Sedan category includes Etios/Dzire/Xcent/Zest. Where as Innova means normal Innova and not Innova Crysta. All the booking will be confirmed only after receipt of minimum 50% advance and balance payment on 04 days before arrival. No provision of making payment on arrival. Our booking process begins within 24 hrs from receiving of advance payment. In case vehicle is not available, 100% advance payment will be returned back to customer. Minimum average per day running is 250 kms. Vehicle running costing is as per garage-to-garage basis. Day will be calculated on calendar date basis. Toll tax and parking fee are included (if any). 5% GST will be additional, on bill. We don't allow overloading. Vehicle will be provided as per seating capacity of vehicle. 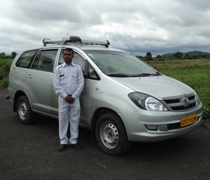 We don't guarantee vehicle availability on emergency basis. It is totally subject to availability. Smoking & eating is strictly not allowed inside vehicle. Cab halting for more than 45 minutes will be chargeable as cab will be on drop only basis. Rates are fixed and non-negotiable. Please do not bargain. For any booking or quotation, please send email to us or just fill-up below given form and submit to us. No booking or quotation will be on phone calls.